I occasionally blog here about bicycling issues that aren’t related to mountain biking. This is a good example, though indirectly, this is related to mountain biking because the DNR guys at this meeting also get involved in mountain bike issues on DNR land. 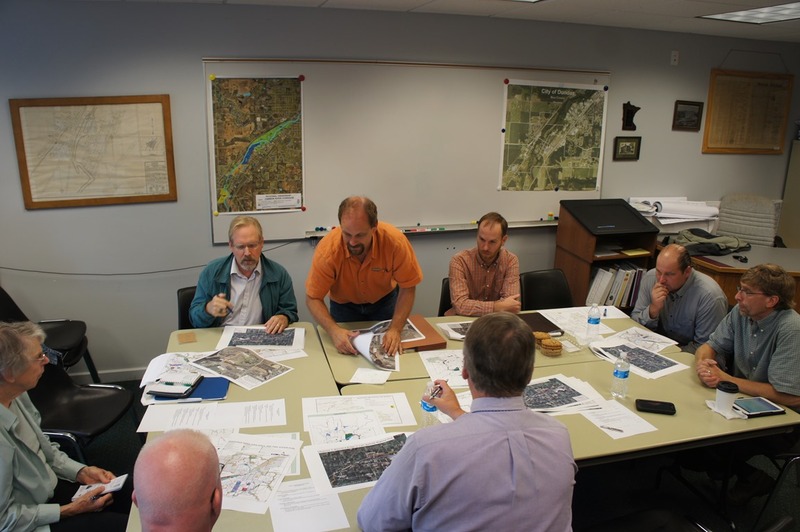 Top officials from the Minnesota DNR Parks and Trails Division held a meeting for a group of local elected officials on Friday at Dundas City Hall to bring them up to speed on current and future developments with the Mill Towns Trail. Local bike advocate Peggy Prowe also was there. 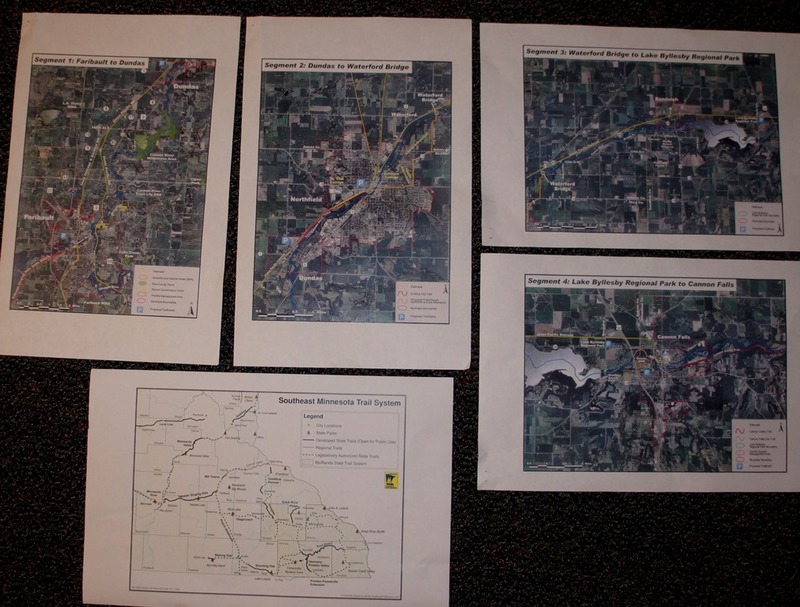 Discussions with Union Pacific Railroad on acquiring right-of-way for the segment from Northfield to Lake Byllesby have not been successful; other possible routes are being explored including a combination of private land acquisition and road right-of-way. I’m particularly intrigued about #2. If you want to know why, ask. Likewise, if you have questions about what’s happening with the trail in the Faribault and Cannon Falls areas, as staff provided updates on developments with those cities, too. What’s the big problem facing Northfield? The City of Northfield currently has no plan to provide a visually significant route for Mill Towns Trail bicyclists to ride through Northfield. Those are my words. I use the phrase ‘visually significant’ because DNR staff was unequivocal: a bike trail that appears to end as it enters a city is a giant disincentive for bikers. Yes, trail bikers like to stop in towns along the trail to eat and shop and sightsee. But without strong in-town trail visuals, people tend to not return. The trail itself as it goes through town needs to be memorable, not just the town. A good example is the visual impact of the Root River State Trail as it goes through downtown Lanesboro (screenshots above from the DNR’s cool virtual tour of the trail). Lanesboro is much smaller than Northfield, of course, so it’s not a perfect comparison. But the point is, once you’ve ridden through Lanesboro on the trail, you don’t forget it and you want to go back. As I blogged back in March, there are other projects and developments here in Northfield that have a bicycle-component: the Northfield Depot; the East Cannon River Trail segment; the TIGER Trail (aka the Northfield Modal integration project); and the Cannon River Corridor recreational concept. So the time is right for more citizens to get involved as bike advocates. Stay tuned for an upcoming announcement. In the meantime, see my three blog posts about the need for Northfield to get its bike act together, including the formation of a regional bike advocacy committee. Had no idea about the activities in Northfield, Dundus, and the connections with Sakatah and Faribault. I agree, “without strong in-town trail visuals”, people tend to not return. I learn so much everytime I visit your site.